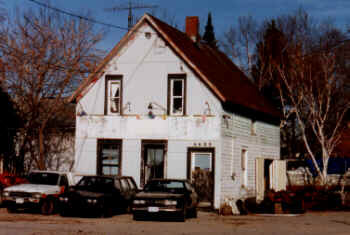 This small wooden frame house on Main Street is set back from the road and has been an automobile sales office since 1964. The house probably dates from at least 1897 and was the home of David Barrows, a harness maker who had his shop in an adjacent building that was later moved to 6586 Main Street, q.v. Registry records [Lot 8, Plan 91] reveal that various parts of the lot passed from David and Ida Barrows to Hiram Scott and back again in 1897. The property belonged to the estate of William Bruce by 1908 and then followed the ownership pattern of the property next door at 6607 Main Street, q.v. 51 Regardless of the land transactions, it appears that the house was the Barrows' home. 51 This comes from Peter Davidson, who is usually pretty reliable, but it does not square with the following paragraph which sounds plausible. Clarification would be helpful on this one.